JSP Forms, Working with credential applications is always a challenging task, as earlier discussed JSP code will be combined with HTML code. While working with forms in any technology GET and POST methods will be used, many developers will prefer POST method why because it carries a large amount of data to the server where as GET method is the default method. Following is an example which describes how the form application will work. Following is an example to understand the form concept. Here the developer created the two text box fields to enter the First Name, Last Name and also created submit button. When compile the code, page will be displayed as static. 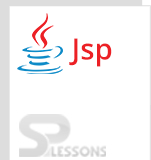 JSP Forms – The GET method is the default method to pass data from client to web server and it delivers a long string that shows up in the browser’s Location. Never utilize the GET method in the event that you have secret key or other touchy data to go to the server. The GET method has size constraint: just 1024 characters can be in a solicitation string. JSP Forms – A for the most part more solid method for passing data to a backend code is the POST method. This method bundles the data in the very same route as GET strategies, yet as opposed to sending it as a content string after a ? in the URL it sends it as a different message. This message goes to the backend program as the standard information which one can parse and use for preparing. request.getparameter() is used to get the First Name and Last Name. When compile the program following is the output will be displayed where enter the details. When click on submit button following output will be displayed. JSP Forms – POST requests can not be book marked. Get method is the default method.